SF Motors, a global electric vehicle company founded in California in 2016, today announced it received issued patent by the United States Patent and Trademark Office with Patent No. 10,106,153 on October 23, 2018 covering the design and methodology for fully autonomous parking. When deployed in consumer products, this technology will allow vehicles to self-park safely and accurately in complex parking zones without operator intervention. "Advancements in autonomous driving technologies are moving quickly, but fundamental user experiences such as autonomous parking have not yet received necessary attention," said John Zhang, founder and CEO of SF Motors. "This patent represents our technological advancement towards making the autonomous parking experience more convenient, effective, and reliable." The patent covers an advanced system architecture and a machine learning-based path generation method for fully autonomous parking. This method involves the fusion of multiple types of sensors, such as camera and LiDAR, for reliable operation in complex parking situations. 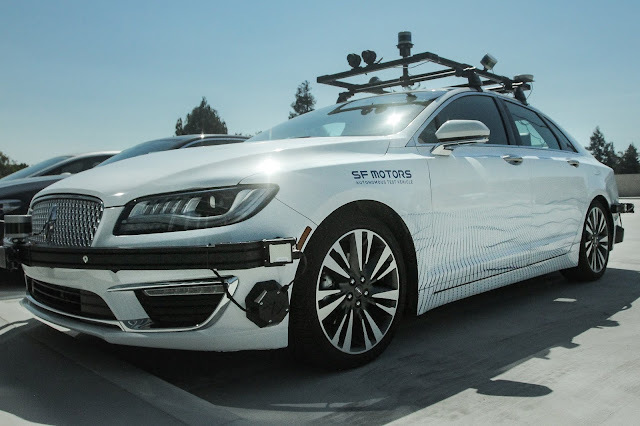 This autonomous parking technology is part of SF Motors' larger vision of offering intelligent electric vehicles focused on safety, reliability and convenience. "Our sensor fusion based solution enables fully autonomous parking through comprehensive real time processing of the multiple dynamic variables involved in parking such as surrounding vehicles, available spots, vehicle size, or parking angles," said Yifan Tang, SF Motors CTO and patent co-inventor. "Our approach to intelligent driving is to apply the optimal combination of advanced driver-assistance systems that offer passengers maximum safety and reliability in real-world environments." SF Motors will gradually introduce a suite of protective autonomy features to their portfolio of electric vehicles only after thoughtful design considerations and rigorous safety standards have been met. The company plans to deliver its first intelligent electric vehicle in China in Q3 of 2019.